Best Way to Protect Salmon? Simon wrote in his decision that the system "cries out for a new approach." Removing the four lower Snake River dams. Last year, Federal District Court Judge Michael Simon rejected the government's latest plan to protect threatened and endangered fish. The plan guides dam operations along the Columbia and Snake rivers. This was the fifth time it had been rejected. Simon wrote in his decision that the system "cries out for a new approach." 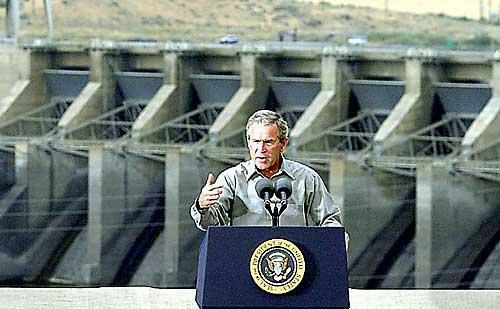 He told the federal government it needed to study the effects of removing or altering the Snake River dams. For years they've said the only way to save wild salmon runs is to tear down the dams on the Lower Snake. They also say saving salmon will greatly benefit other animals, like endangered southern resident killer whales. Federal fish managers recently released a new recovery plan for several threatened runs on the Snake River. Dam advocates touted what they saw as dams' economic and power benefits. The four dams -- built in the 1960s and 1970s -- provide about 5 percent of the region's power demand, or roughly enough power for 800,000 homes for a year. They also make it possible for barges to reach the West Coast's most inland port: Lewiston, Idaho, 465 river miles from the Pacific. The lengthy debate has sparked some cool salmon research in the region. Dam managers held public meetings throughout the Northwest. More than 2,300 people attended, although some fish advocates weren't happy with the forum. Dam operators received almost 4,000 comments about what to do to best protect salmon. The government is developing a draft environmental impact statement, due out in 2020.